This August was a bit of a roller coaster ride and fishing ended up taking a seat on the back burner. A storm raged through our area and really did a number on a lot of trees, providing endless hours of cleanup in our yard. A family emergency then took priority over that and we are all just now getting back to normal. The few times out fishing were treasured for many reasons, all challenging and successful in one way or another. Bluegills from the kayak a few days before the storm were a blast. They were all aggressive and scrappy no matter the size, which is just how I like my panfish! 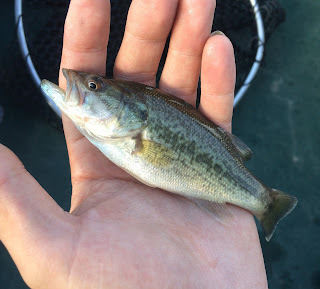 Many handfuls of 7 - 10 inch gills were caught and released between us along with a few just over 10 inches. Light tackle and line was the ticket and lures out produced bait by far. Chances to fish were more about fishing for the sake of fishing and everything and anything that would come with it. An opportunity presented itself to fish in the mid day sun and 30 degree heat for a few hours, not my ideal conditions but I made the best of it. Goldeye, eater channel catfish and freshwater drum were eager to bite as I sat on the rivers edge and the next spot I tried produced a micro bonanza of juvenile fish. 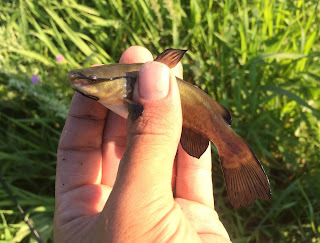 I was able to catch my two smallest specimens of channel catfish and black bullhead from the run. 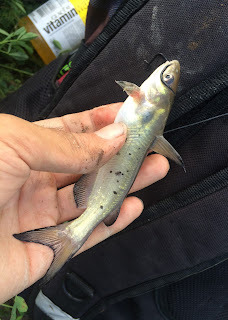 While this may not appeal to most, I was thrilled with the catches and continued to land a few more along with some common shiners and creek chubs before moving on to the next section of river before having to call it a session. On another outing in slightly more ideal conditions I happened across my first few largies and while they weren't very big, they were a long time coming. They are not native to Manitoba and only found in a select few bodies of water and I have spent more than a handful of times out trying to land one big or small. Not near trophy standards but a new species under the belt sure felt great! Although there aren't any pictures, there have also been some great bird sightings, from a female night heron and a pair of egrets to a few owls on hydro lines at dusk. Many species of birds are grouping up and preparing for their long flight south and with the harvest now in full swing and the days getting shorter it seems fall is slowly on it's way and the fishing can only get better!